"The situation in Al-Qadarif is out of control and the student Moayed Ahmad Mahmoud was killed," said Mubarak al-Nur, a lawmaker in the city 550 kilometres (340 miles) from the capital Khartoum. Nur called on authorities "not to use force against demonstrators, who are asked to peacefully exercise their right" to protest. According to AP, anti-government street protests broke out Thursday for the second consecutive day in a string of cities in Sudan, including the capital Khartoum where police used tear gas to disperse protesters. In one city, demonstrators surrounded the office of a local governor, forcing him to flee the scene in a speeding car under a hail of rocks. Besides Khartoum, Thursday's protests took place in Gadaref in eastern Sudan, Dongola and Barbar to the north of Khartoum, where there were no protests on Wednesday. Demonstrators took to the streets in the Red Sea city of Port Sudan, Barbar and Atbara in the north and Nohoud in western Kordofan province. A video clip obtained by The Associated Press purported to show the governor of Gadaref fleeing after protesters surrounded the local government's building. The video showed a speeding sports-utility vehicle as it came under a shower of rocks thrown by protesters and coming close to running some of them over. 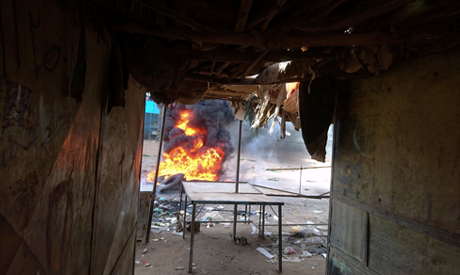 In Atbara on Wednesday, a mob torched the local headquarters of President Omar Bashir's National Congress Party. Another video obtained by the AP showed the glass-and-steel building engulfed in flames along with several cars parked outside. Authorities responded by declaring a state of emergency in the city and a night-time curfew. This week's protests coincided with the return to Sudan of opposition leader Sadeq al-Mahdi, the country's last freely elected leader, whose government was overthrown in a 1989 military coup led by Bashir. Al-Mahdi was living in self-imposed exile outside Sudan for nearly a year. Thousands of his supporters welcomed him home on Wednesday. Addressing supporters, al-Mahdi proposed the formation of a national unity government to tackle the country's chronic economic problems and the internal displacement of Sudanese as a result of violence. Bashir was indicted in 2010 by the International Criminal Court for genocide during the conflict in Sudan's western Darfur region, which began in 2003 and is blamed for at least 200,000 deaths. Sudan's economy has struggled for most of the 29 years Bashir has been in power. The situation rapidly deteriorated after the secession of the south of the country in 2011, which deprived Khartoum of the oil fields there.